Need something for your kitchen? available in all six glaze colors, $86 a place setting. Ask for a quote for customized combinations. 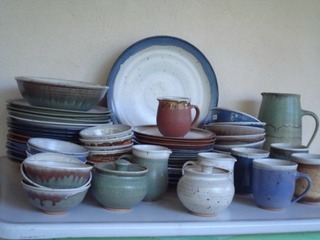 All pieces are wheel-thrown in a one-person studio. 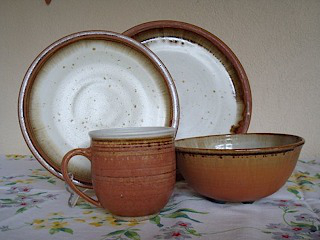 Variations are inherent in handmade, high-fired stoneware pottery, making each piece unique. Even within sets, individuality exists. The slight differences in size, shape and glaze shades are part of the pleasure of living with and using hand-made dishes. Any piece may be glazed in any one of the six colors offered on this website. The dishes are oven, microwave and dishwasher safe. Do not use them on the stove top or place in a pre-heated oven. Bring the dish to room temperature before placing it in the oven or place it in the oven as it pre-heats.